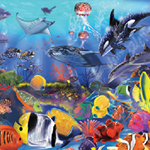 Aquatic Hidden Stars is another point and click hidden objects game from Hiddenogames.com Stars are hidden everywhere in the aquatic pictures. Find them and hit it. Every wrong clicks will reduce target time. Have Fun!